Damen Shipyards Group has recently unveiled a Water Injection Dredger (WID), courtesy of a plug & play system aboard a Damen MultiCat. Such capabilities are typically found only on dedicated platforms, though Damen realised that the Multi Cat’s forward propulsion and manoeuvrability made it a suitable platform for this type of dredging. 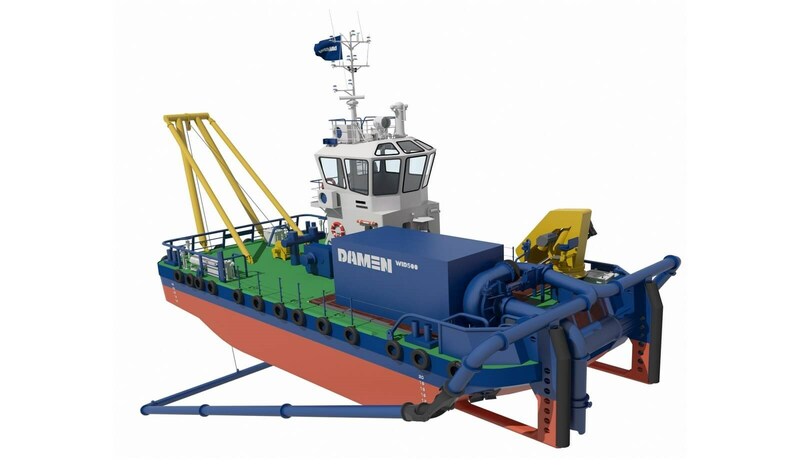 “Damen invented the MultiCat as the ideal dredge support vessel – what I like to think of as floating workbench – for Cutter Suction Dredgers (CSD). This is a logical step forward for a platform that has dredging in its DNA,” stated Damen Product Director Dredging Olivier Marcus. This is not the first time the MultiCat has demonstrated such versatility. In the past, Damen has already fitted DOP pumps or a plough on the stern A-frame to carry out sand mining and maintenance dredging activities. The MultiCat WID dredger will take a different approach. By injecting the silt with high volume, but low-pressure water, the accumulated soil will become a density flow and by utilising the current and/ or gradient the silt will be removed from ports and waterways including rivers and channels, offering a cost-effective, sustainable approach to dredging. This very straightforward approach applies containers – 2 x 40ft for a 500mm system and 3 x 40ft for a 600mm system – on board a MultiCat in a plug & play system that can be applied to an existing vessel for added versatility. The MultiCat WID Dredger will be fitted with a Damen Dredge Pump – a wear resistant piece of equipment that is built to just keep going in the toughest of working environments. Its mechanical seal guarantees minimal maintenance requirements. “We have previously customised tugs, fitting them with water injection capabilities in order to carry out port maintenance capabilities. This type of dredging represents an effective solution that, for just a small investment, delivers really significant additional benefits to a platform already well-suited to a diverse range of tasks,” Mr Marcus concluded.